Okay, visual learners, this one is for you. Just because you think in pictures instead of words, you aren’t shut out of the storytelling world. You have stories in you. You just need to access them in a different way. With this method, you’ll get to use a picture, which will probably speak to you more, and if you get stuck on the rest, you can always get your kids (or your friends) to help you with the brainstorming. Kids are very useful for brainstorming (which is good because they aren’t so much help with chores). To be honest, this one is pretty great for all kinds of brains. I’m not particularly visual myself, but I still use this method probably more than any other. Are you ready? You start with a picture. Any picture, really, but it helps if it’s of something unusual or in some way particularly appealing to you personally. I often troll the internet for inspiring pictures (and collect many of them here). I also take advantage of my amazing photographer friends. But the picture doesn’t need to be professional. For today’s example, we’ll use this low-quality snapshot I took with my phone when I was out walking a few weeks ago. So here’s how it goes: we look at the picture and we just start asking questions. The first question is easy. Now write down (or keep it in your head if you can do that sort of thing) as many answers to that as you can think of. Don’t skip over the obvious. Don’t discard the ridiculous. Not yet. You’ll probably have several possible answers to this, too. Try it out with several of your original “whats” and see which story appeals to you the most. 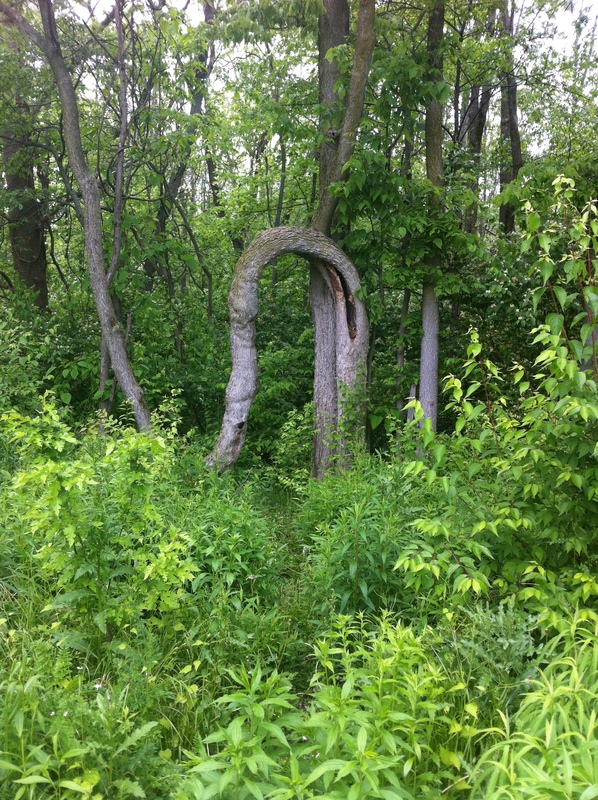 Why is this twisted tree here? Why is this giant snake posing as a tree? Why is there a backwards letter N in the woods? Sticking with the most ordinary of all our responses: This is a twisted tree which grew around a rectangular object that is no longer there. Why was the object there? How did the tree grow around it? Why was the object taken away? What will the tree do now? Again, unless a story just jumps out at you and starts telling itself (this is a thing that happens), you should brainstorm several ideas for each answer. That way you can find one that’s silly, funny, tragic, terrifying, or inspiring (depending on how you like your stories). And that’s all there is to it. A picture. A few questions. As many answers as you can dream up. String it all together, and you have a story. Get yourself over to Tumblr or Pinterest or your favorite photography blog (or your own photo archives for that matter) and give it a try. Even if you don’t feel brave enough to tell anyone your story, I bet you’ll have fun. This is one thing that always makes my brain happy. It might make yours happy, too. Also, check back on Wednesday. I’ll make a real story out of some of these brainstorming ideas. Any votes on which ones?